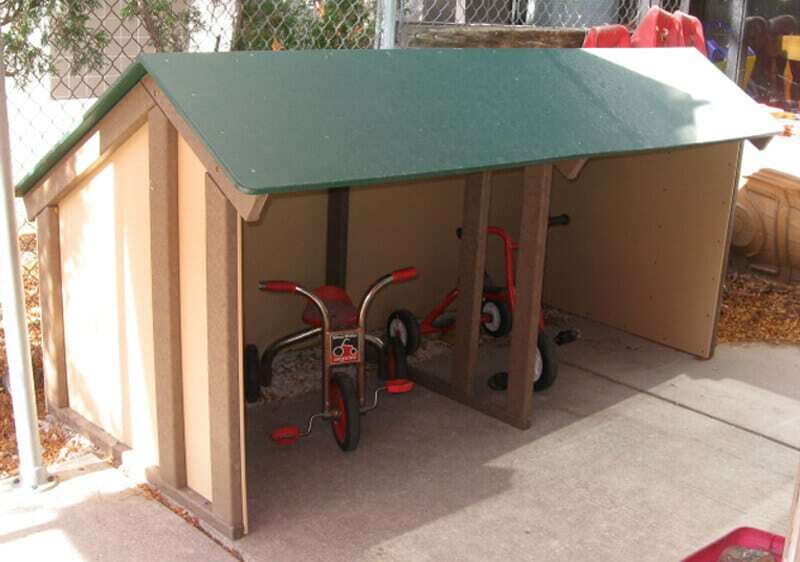 Trike Garage is designed to give the children a place to individually park their trikes at the end of the day so the teachers and staff do not have stack them into a storage shed. In the back of the trike garage, there are hooks for hanging bike helmets. Trike Garage can hold both wagons, carts, scooters, tricycles, push cars, and any other type of riding activity you would like as well as your road sign packages. Because it’s at ground level, it allows children to access the bikes, both to get them out and put them away as well as get out the stop signs and yield signs and put them away also. Trike Garage will hold approximately 6-8 riding activities depending on their size and width. The 3-sided structure keeps blowing rain and blowing dirt off your bikes, providing a great storage area on your playground rather than having the bikes left all over the playground or being stacked into a shed or dragged into a hallway of the school.